I’ve written before on the topic of supplemental lithium orotate for mood, anxiety, and irritability. (Read the previous article here: A little lithium and B12 makes the world a happier place — for some.) But what about the effects of the mineral lithium on your overall health? I read a lot of studies on health and genetics (a lot! ), and I keep finding research on lithium popping up in unexpected places. 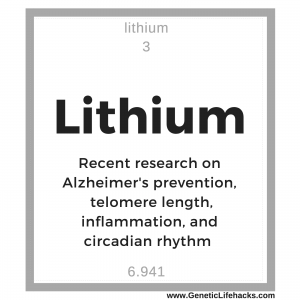 Topics such as circadian rhythm dysfunction, Alzheimer’s disease, telomere length, type 2 diabetes, and obesity… not the subjects that I expected to lead me back to lithium! How is lithium affecting our body and brain? The rest of this article lays out the evidence that increasingly shows the importance of this mineral in our health and longevity. I think it is important to examine the research and look at the long-term effects and safety questions that always come to mind when talking about lithium. There is such a stigma, at least in my mind, around lithium that I’ve hesitated at times to talk with friends and family about it – a hesitation that no one seems to have in recommending other minerals such as magnesium or potassium. I want to clarify before getting into the studies on lithium what ranges of dosages the studies are talking about. The prescription medication that most people are familiar with for bipolar disorder is usually in the form of lithium carbonate. Lithium orotate usually comes as a 120mg supplement that gives about 5mg of elemental lithium. The amount of lithium that we get in foods and drinking water varies based on the mineral content of the soil, with estimates of .5 to 3mg per day. A provisional RDA of 1mg/day has been recommended. [ref] So a 120mg lithium orotate (5mg elemental lithium) supplement would average around twice the normal daily consumption from food and water, while the prescription dosages are closer to 80 to 100 times normal daily intake. A new study came out in November 2017 on Alzheimer’s rates and natural lithium levels in the drinking water in Texas. In an article about the study (which is easier to read than the research paper:-), the lead author of the study explains the findings. Water samples from almost all of the counties in Texas were tested for their natural levels of the mineral lithium, which varies depending on the concentration in rock and soil. The researchers found that Texas counties with higher levels of lithium in their groundwater had less of an increase in Alzheimer’s rates compared with counties that had lower levels of lithium. This isn’t a total surprise since previous studies had linked lithium to a decreased risk of dementia, but it is a great confirmation at a large scale population level. A lot of the initial studies were observations linking bipolar patients taking large doses of lithium carbonate and having lower rates of dementia. A 2015 review in the Journal of Alzheimer’s Disease analyzed the data from three randomized placebo-controlled clinical trials of lithium for treating patients who had already been diagnosed with Alzheimer’s disease. The trials found that lithium “significantly decreased cognitive decline as compared to placebo”. An October 2017 article in JAMA Psychiatry details a nationwide study in Denmark on the exposure to lithium in drinking water and the incidences of dementia. This was a large study, with 73,000+ dementia patients and 733,000+ people without dementia as the control. The study found that there was a decreased rate of dementia in those people exposed to naturally higher levels of lithium in their water (measured since 1986). A March 2018 animal study looked into the mechanisms of how lithium chloride lowers the risk of Alzheimer’s. It found that lithium chloride caused an increase in soluble β-amyloid clearance from the brain. In mice genetically bred to be a model of human Alzheimer’s, lithium chloride restored the clearance of soluble β-amyloid to the levels of normal mice. One big thing to note from this study is that lithium chloride did not affect β-amyloid that had formed plaque already. A study in 2015 looked at the effects of microdoses of lithium on a mouse model of Alzheimer’s disease. The study found that small doses of lithium carbonate in the drinking water of mice carrying the genes for Alzheimer’s disease caused “decreased number of senile plaques, no neuronal loss in cortex and hippocampus and increased BDNF density in cortex, when compared to non-treated transgenic mice.” This was a follow-up study to the human study in 2013 which showed that microdoses of lithium stopped the cognitive decline in Alzheimer’s patients. Telomeres are the sequences of DNA that are found at the ends of each chromosome. This sequence protects the ends of the chromosome from deterioration. The common example given is to think of telomeres like the plastic on the end of shoelaces that protects the shoelace from fraying. When cells undergo cellular reproduction (mitosis), a little bit of the telomere is lost, and thus telomere length is considered a biomarker of cellular aging. Shorter telomere length is associated with several age-related chronic diseases including Alzheimer’s. A recent transgenic mouse study found that lithium carbonate treatment leads to longer telomere length in mice that are bred to have Alzheimer’s disease. Interestingly, the normal mice had no effect on telomere length from lithium. A meta-analysis of 13 studies found that Alzheimer’s patients have shorter telomeres. A human study looked at telomere length in patients with bipolar disorder. The study found that patients with bipolar disorder (not on lithium) and their relatives had shorter telomeres lengths than healthy, unrelated people. More interestingly, patients with bipolar disorder who were lithium-treated had longer telomere length than patients with bipolar disorder who were not taking lithium as well as relatives of bipolar patients. Telomere length is a new field of investigation for researchers looking into so many different topics of aging, longevity, and disease. I don’t think the handful of studies on telomere lengthening from lithium can really lead to a conclusion; I look forward to seeing what future studies tell us on the topic. A recent cell study looked at the potential of lithium plus caffeine, theobromine, and catechin on the innate immune system and inflammation. The results showed that stacking lithium with caffeine, theobromine, and catechin was more effective as an anti-inflammatory than using them separately. Another recent study looked at the anti-inflammatory effects of lithium on cells containing the SOD2 genetic variant rs4880. The study found that those with rs4880 alanine allele (G/G for 23andMe) had more of an anti-inflammatory response than those with the valine allele (A/A for 23andMe). This was a cell study though, so it is hard to know how well this translates to the whole body. What surprised me about the Nov. 2017 study that I referenced above was that Texas counties with higher levels of lithium in their water also had lower levels of obesity and diabetes. I was surprised by this because one of the side effects of long-term, high dose lithium carbonate usage is an increased risk of hypothyroidism and possible weight gain. For a long time, it wasn’t really understood how lithium worked for bipolar patients. (Quite a few psychiatric medications have been used for decades without fully understanding the mechanisms by which they work – or don’t work – for people.) Studies over the past decade or two have shed light on the neurobiological mechanisms of lithium and genetic studies have increased that knowledge. The American Chemical Society published a great overview the topic in 2014, “Neuroprotective Effects of Lithium: Implications for the Treatment of Alzheimer’s Disease and Related Neurodegenerative Disorders“. One of the effects of lithium is its inhibition of GSK-3β (glycogen synthase kinase-3 beta), which is involved in neuronal cell development and energy metabolism. Genetic mutations of GSK-3β increase the risk of bipolar disease. Lithium ions compete with sodium and magnesium ions in the body for binding sites in certain circumstances. Lithium’s inhibitory effect on GSK-3β is thought to be due, in part, to binding to a site that is normally occupied by magnesium. For a very thorough overview of the biochemical properties of lithium, including its effect on the activation energy of water within a cell and its effect on mitochondrial function, please read through “Towards a Unified Understanding of Lithium Action in Basic Biology and its Significance for Applied Biology“. Our body’s core circadian clock is run by a couple of core genes that are expressed during the day and a couple of core circadian genes that rise at night. It is this daily rise and fall of gene expression that then drives our internal daily cycles of waking and sleeping, temperature, and energy metabolism. GSK-3β is involved in phosphorylation of both the day and night core circadian genes. Lithium is considered by some to be an essential trace element, and a complete elimination of lithium causes a decline in fertility, higher mortality rates, and behavioral abnormalities. [ref] But, like all substances, there is always a toxic upper limit. Patients taking lithium carbonate or lithium chloride for mood stabilization show a variety of side effects, depending on dosing. Most patients taking prescription lithium carbonate get blood tests done at regular intervals to determine their serum lithium levels. Plasma lithium levels above 1.2 mM cause nausea, diarrhea, and tremor. [ref] Other side effects noted by patients taking lithium chloride include increased thirst and urination, weight gain, and mental dullness. It was theorized that bipolar patients taking lithium may drink more calories due to increased thirst, thus causing weight gain. [ref] Other side-effects of higher doses of lithium include increased risk of kidney problems and interaction with hypothyroidism. Lithium orotate, as a supplement, comes in much, much lower doses than the lithium in prescription lithium carbonate. There is one case report, though, of nausea and mild tremor from a teenager taking 18 tablets of a supplement that contained 100mg of lithium orotate. If after reading through all the information about lithium orotate you want to add it to your supplement list, here are a couple of brands that are well regarded by my family: Weyland’s Lithium Orotate and Seeking Health Lithium Orotate. Read through the reviews and go with a brand that you trust. As with any supplement, I suggest talking with your doctor if you are on a medication or if pregnant or nursing. The study on stacking lithium with caffeine, theobromine, and catechin for an increased anti-inflammatory effect was interesting. If you are considering this combo, a good source of theobromine is cacao nibs. Catechins and caffeine are found in green tea. dosage accuracy. If I want 2 mg, I need to be sure of my pills. Are there cases of toxicity of those who get it in drinking water? I have heard that Lithium is needed for Vit B12 in some cases. Thanks for commenting. From the research studies that I’ve read through, the thyroid issues with lithium are mainly a risk in those taking the prescription amounts of lithium carbonate. There is one study that I found on lithium in drinking water and thyroid hormone levels– in pregnant women: https://www.ncbi.nlm.nih.gov/pmc/articles/PMC4652143/ It was conducted in the mountains in the Andes, and it looks like they were also dealing with cesium and arsenic in the water. The highest amounts of lithium in the drinking water were in the 1.6mg/L range, so depending on the amount of water consumed in a day, people could realistically be exposed to around 5mg per day from drinking water. The study did find that those with the lowest intake of lithium had a statistically significant lower average TSH level, but the differences were small – THS around 1.5 for lowest levels up to 1.7 or 1.8 for top two thirds of lithium intake. But all of the averages and research studies don’t take into account an individual’s biochemistry :-) Thyroid levels are easy to test and something that, in my opinion, people should get tested whether they are are taking a lithium supplement or not. I have not read of any cases of toxicity due to natural lithium in drinking water. When I take one lithium orotate anywhere between 2.5 mg-5 mg, my eyes hurt. Any knowledge on this? I read online that a doctor discovered eye damage in patients on very high dosages of lithium. 2.5mg is about what we get daily from food, though, so I don’t think that could be considered a high dose. Prescription lithium dosages are usually in the 600 – 1200 mg range for bipolar disorder. Everyone is different… that is what this website is all about! So I’m glad that you posted your experience here, and perhaps someone else will be helped by it. This was a pretty amazing, well written, and well documented article. Thanks for sharing all this! I have been taking lithium orotate for a few years now and I’m very pleased with the results. I was very hesitant to try it for Bi-polar symptoms so I took the information I found to my doctor and asked her opinion. I am 55 years old and refuse to take prescriptions for this because of the horrific side effects. She had not heard of it and asked me to wait until she could do some research. She later told me that I had quite possibly found something that could help many of her patients. She recommended I only order from Pure Encapsulations because of their reputation and clean lab environment. I started with 5 mg and then worked up to 10 mg. I’m still taking 2 per day and still ordering the Pure Encapsulations. I had blood work done yesterday and my potassium levels were slightly elevated but within reason. Other than that everything looked good. I hope this helps anyone considering this mineral supplement because it has helped me get through menopause! Thanks for sharing your experience with lithium orotate! Thank you for sharing your positive response with us. You had blood work, but didn’t they test for lithium levels too? That would seem most apropo and informative. I can’t be sure if its the lithium, because I also was trying methylfolate at the same time, but I came up with bad lesions on my finger tips. They appeared as paper cut type wounds on my finger tips after taking lithium orotate 10 mg, and then seems to go away after a few days being off it. I also stopped the methylfolate and when I resumed lithium orotate the lesions came back again. They were difficult to heal and quite painful! I also had skin rashes on my thighs that seemed to be exacerbated after taking a shower and from the alkalinity of the bar soap. however, I would not have had this otherwise. My question is this: my psychiatrist has reluctantly allowed me to take 3 lithium orotate 5mg along with 450mg lithium carbonate/day and monitor my blood. Will the additional lithium orotate show up in my blood levels? I would assume that the blood test for lithium will show all the elemental lithium, whether you take it as lithium carbonate or lithium orotate. Your doctor should be able to tell you more on that. My boys and I started on 5mg of lithium orotate in various forms (liquid, sublingual, and chewable). Our serum lithium test showed 0, our urine was low, and our HTMAs were low. Within a year our serum was high, urine was off the range high, and our HTMAs showed high. I do not understand how we went from so low to prescription strength high as my doctor put it on 5mg of lithium orotate. My doctor had no answers. What is the best way to test lithium? Serum, urine, hair? Just an FYI about testing for lithium: When I had my hair tested awhile ago, lithium was present. The dr who ordered the lab work was surprised and asked if I supplemented. I’d been taking a low dose almost daily for maybe 5 years at the time, for cognitive benefits. Because my level was quite high (d/r the value right now), I usually take it every other night now. Oh, how I wish it helped with my insomnia! But I think I’ll try upping my dose and see if I can get this benefit as a result. Hi I want to thank you for this article! It just might be an answer to my prayers, for me and my son. I have been battling chronic illness for awhile now and all the effects. I have Fibromyalgia, Lyme disease with a Mycoplasma co-infection. I have also battled obesity since a very young age. I have never been an over eater or even a large eater. I often get full very quickly but yet from childhood have gained weight at a rapid rate. I have been tested for diabetes and thyroid issues always coming out on the negative side. Thyroid issues run in my family on the women side. I am now pre-diabetic due to the weight. I am not a candidate for the gastric surgery because as I said I am not an over eater and because I have a compromised immune system due to the other illnesses. After reading this Inam wondering now if maybe all I have been needing was lithium orotate and better drinking water? I have been diagnosed with major depressive disorder. I have also had issues with anxiety and anxiety attacks. I really hope that Lithium orotate can help me begin to feel more balanced not just mood wise but cognitively too. I feel like I am past 80 yrs. Old but I am just 43. Due to my many illness I am currently taking a certain amount of medications daily. Will taking lithium orotate cause me any issues with my current medications? I read there to be some possible complications with magnesium and I take magnesium malate 1300 mg. daily. Also potassium chloride 8 MEQ, I also take gaba aka gamma 1,000-2000 mg.depending on my situation. All to help prevent the paralyzing muscle spasms. I take other medications as well for persistent migraines and asthma. My son suffers from circadian rhythm disorder and reading your article was both enlightening and maddening. Because I had never heard of it before. Or its uses of treatment. Of the many years of trouble we have both experienced from this issue it seems to me his Dr. should have had the responsibility to mention it. My son also suffers from mental illness which we have not reached a diagnosis for but he he meets every symptom for bi polar disorder already. I just keep thinking maybe if we had got a hold of this information sooner and gotten him started sooner on it, it would have prevented some of the hell he has gone through. Thanks for reading and posting your comment and question. You ask about interactions with medications… I don’t know of any major interaction with magnesium, potassium, or GABA supplements. But you should definitely check on interactions with prescription migraine and asthma medications — perhaps talk with your pharmacist. The connections between circadian rhythm, bipolar disorder, and depression are becoming clearer every day with more and more research coming out. If you haven’t read it, here is one of my articles on mood disorders in general and one specific to bipolar, depression, and circadian rhythm. I would encourage you to click on the referenced studies in those articles for lots more information. As for your doctor not mentioning circadian rhythm, well, the research is fairly new that ties it together. A lot of the genetic research on the connection between bipolar disorder and circadian rhythm genes is less than 5 years old. You said ‘live and learn’ — that pretty much sums up being a parent :-) Your son is lucky to have you learning and advocating for him.